Boneless skinless chicken breast is an American staple if one eats meat. That said, I don't like making it that much because it always comes out dry or just terribly boring. This recipe has convinced me that I should eat more of it. It's incredibly moist and has just enough other stuff to make it delicious, without ruining the versatility. I made 4 servings' worth of this stuff and will be putting it on a salad tomorrow, stir fry on Thursday, and something else on Friday (I'm flying solo with the kid this week because my husband is taking care of his mother after minor surgery). In a large bowl, combine all but the chicken and stir thoroughly. Add in the chicken, using your hands to make sure the marinade thoroughly covers the chicken. Allow to marinate at least 30 min (mine was overnight because I have more time to do stuff in the evenings after the kid goes to bed). Preheat oven to 400 degrees. Heat a large grill pan over medium-high heat. Once very hot, place chicken breasts smooth side down on pan. Do not touch until caramelized and the chicken releases easily from the pan. This should take 3-5 min. per side. Remove chicken from the grill pan and place on a sheet pan and into the oven to finish cooking, 12-15 min. Chicken is done when the juices run clear. Allow the breasts to rest 5-10 min. Slice against the grain and serve. 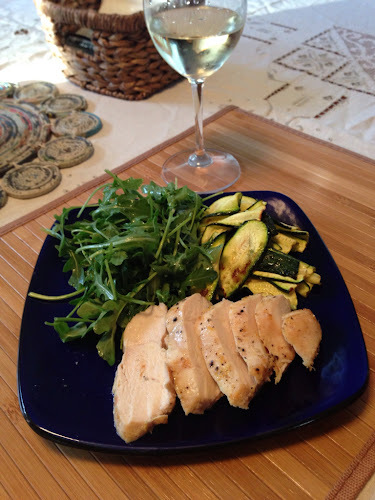 I served it with Broiled Zucchini and arugula with leftover sherry-walnut vinaigrette. And of course a glass of the wine we didn't finish on Saturday and Sunday. We are feminists of varying location, age, shape, and culinary preference. This blog is a feminist act: sharing delicious and nourishing recipes without placing value judgments on the food or our bodies. Authors claim copyright to original content. Links/reprints may be subject to other copyrights. Ethereal theme. Powered by Blogger.